The School of Genetics and Microbiology provides doctoral training through provision of a structured programme of research and study. 1. A formalised integrated programme of education, training and personal and professional development activities. PhD students undertake original research via a structured PhD which promotes the development of in-depth knowledge of their field of study, research skills, critical analysis and communication skills. Any skills gaps that may be identified are addressed by the availability to formal training. Professional development is facilitated through the student’s participation in seminars, workshops and conferences at national and international level. PhD students are expected to undertake taught modules during their PhD (minimum 10 ECTS- maximum 30 ECTS). 2. The development of discipline-specific knowledge, research skills and generic / transferable skills. The School provides core modules in presentation skills, a seminar programme and journal club. Optional modules are available in the following : Genetics and Microbiology, Molecular Evolution/Population Genetics/Bioinformatics Seminars, Advanced Techniques , Bioinformatics, Programming in Perl. Students may avail of the inter-institutional modules in the Biomedical Sciences strand of the Dublin Region Higher Education Alliance. The Postgraduate Certificate in Statistics (30 ECTS) is also available to PhD students in the School. 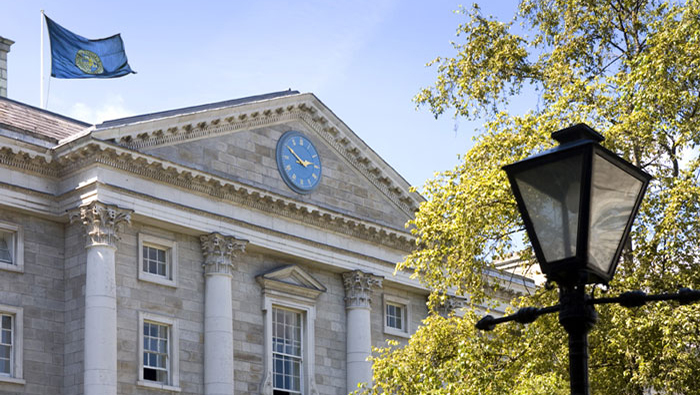 Trinity College offers a range of modules to develop generic and transferable skills through the Innovation Academy (innovation, entrepreneurship and leadership); Centre for Academic Practice (personal effectiveness, teaching skills), Library (information literacy) and Career’s Service (career management). 3. Declared outcomes and graduate attributes in line with national and international best practice. The School offers a doctoral training programme in accordance with the learning outcomes expected of a research doctorate (Level 10, National Framework of Qualifications), as specified in the Calendar Part 2 (1.27.4) and the IUQB guidelines for Good Practice in the Organisation of PhD Programmes in Irish Higher Education (2009) and the IUA Irish Universities’ PhD Graduate Skills document which has identified the following skills as relevant to PhD student education: -research skills and awareness; ethics and social understanding; communication skills; personal effectiveness; team-working and leadership; career management ; entrepreneurship and innovation. 4. Supervision by a principal supervisor(s), normally with a supporting panel approved by the institution. Trinity College has a policy for eligibility to supervise research students (Calendar Part 2, 2.9). All students are appointed a primary supervisor and may also have a co-supervisor and/or adjunct supervisor and/or supervisory panel. A panel is convened to consider the student’s progress and their continuation on the PhD register. 5. Progress to completion is formally monitored against published criteria and supported by formal institutional arrangements in line with national and international best practice. PhD students undergo a formal annual progress review as well as a robust panel review to confirm continuation on the PhD register within the first 2 years of registration. The final examination of the thesis involves the appointment of 2 examiners, at least one of which is external to Trinity College and an internationally recognised expert in the research area of the thesis. PhD examiners are approved by the Dean of Graduate Studies. 6. Appropriate placements, rotations and assignments across wide sectors of the economy are encouraged for inclusion as part of the structured PhD programme. PhD students are eligible to participate in the Innovation Academy which provides access to industry-mentored projects as part of the Opportunity Recognition module. Further details can be found in our postgraduate booklet (PDF document, 195 KB). Find out more about the research projects we work on in the School of Genetics and Microbiology.